See or send to Bud Trapp. For more information see the web site. Dottie Bang treated us to a demonstration on how to turn a natural edge goblet. 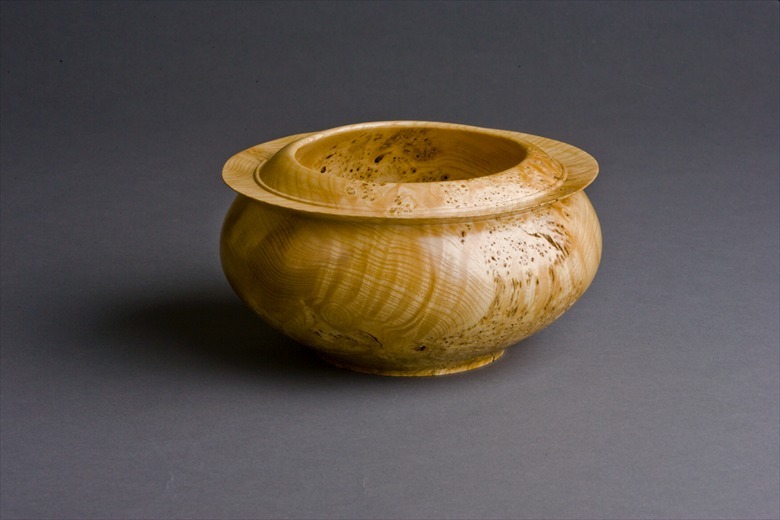 Starting with a green log (actually more like a branch), she rounded, hollowed, cupped, stemmed and refined the piece until there it was, a goblet with natural edges at rim and base. Dottie, you make it look so easy. Thank you for showing us the "how to do it". Our February meeting will be a little different than normal. To make sure that we have enough time for our program, we will start with the program, and have a business meeting at the end. No president’s challenge or show and tell. It will be a full meeting! Don’t forget to pay your dues! Please excuse me for holding things up this month. Came down with the flu, and lost a week. Guess the good news is that is all I lost! So, everything is last minute here. We had a good attendance at the board meeting, thanks to everyone who came and contributed! Bud drove a budget proposal through, which we will ask for membership approval at the meeting. It shows that we will are budgeting to spend ~$1K more than we bring in. In addition, we will be asking for the membership to approve 3 minor changes to the bylaws. 1) change the requirement for monthly board meetings to be quarterly, 2) change the member at large position to be appointed by the board in all cases, and 3) correct the vice president’s job to reflect the current operating mode of the club. The minutes, budget, and bylaws will be in the member’s only part of our website, so please check them out. I will be the champion of the participation with the Santa Clara Carvers. So, we have agreed we are a go. Remember, this is the last weekend in May. I am asking that everyone turn a piece, between 6 and 12” in diameter. It must be augmented in some way, segmented, colored, carved, textured, … You get the picture. We will then only do a people’s choice competition. Not categories or classes, just votes by the public. No prizes, just bragging rights! I will offer to collect turnings at the May meeting and return them in June for those of you that just can’t drive that far. But, if past shows are any indication, you will be sorry you missed going through the show. At the club meeting, I will be passing another survey (yah, probably one a month! ), asking you about doing a club competition. Participation has been steadily going down over the last several years. This isn’t a new concern, but one I would like to get to the bottom of. I feel the club competition is important for the health of the club. It is a lot of work to arrange and make happen, far more than we should probably be dedicating to for the level of participation. So, I want to know if A) you think we should have a competition, B) if we have one will you participate, C) if there are things we should change, what are they and D) are you willing to help make it happen. The members only section of the website is now more complete with not only the club roster but also club financials, bylaws and board activity information. On the website click on the menu "Club" and "Member Info". It is password protected, so if you need that information, just ask.